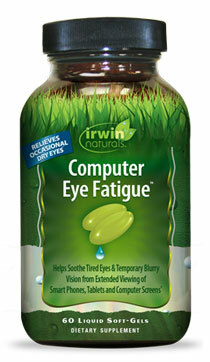 Computer Eye Fatigue, 60 liquid soft gels (Irwin Naturals) - Penn Herb Co. Ltd.
With the ever-increasing use of visual displays in our daily lives – from the computer screens in our offices and homes to televisions, tablets, and smartphones – we subject our eyes to more taxing visual stimulus than ever before. That is why we developed Computer Eye Fatigue™, an advanced multi-pronged formula specially-formulated to help soothe tired eyes and temporary blurry vision, and to help relieve occasional dry eyes caused by the extended viewing of these various visual stimuli. At the heart of our formula is AstaReal® Astaxanthin, a naturally occurring carotenoid that has been shown in recent studies to display enormous antioxidant activity. Astaxanthin also supports ocular blood flow. Our formula features Lactoferrin, an important protein that has beneficial properties for eye health. In addition, this product includes Fish Oil which supplies supportive EPA and DHA to help combat occasional dry eyes. Computer Eye Fatigue™ contains antioxidant rich Vitamin C and delivers a range of botanicals such as Eyebright and Ginkgo leaf extract, traditionally used to support eye health, and Black Currant for additional antioxidant support. Helps soothe tired eyes & temporary blurry vision from extended viewing of smart phones, tablets and computer screen. Adult, take 3 liquid soft gels twice daily with a meal and a full glass (8 oz) of water. SEE PDF LABEL FOR CAUTIONS.